Bob: Drew, I remember one of the first conversations we ever had about Summer Wine, and you said it was ‘essentially three old men talking about death’. I think this episode is pretty much the epitome of that! We start with our heroes being almost mown down by a speeding hearse containing their late friend Murdoch (‘the first time he’s ever passed us without raising two fingers’ – Compo) and from here onwards we get 28 minutes of vaguely surreal musings on the nature of mortality. It’s a very blunt, Northern, 1970s attitude to death as well. Unsentimental, almost, which rings true for me… ‘Eeee well, when it’s your time to go, it’s your time to go,’ was one of my Gran’s catchphrases whenever a friend or a neighbour sloped off this mortal coil, and my parents now are equally stoic. Us pampered youngsters are cosseted and grew up in an age of gigantic medical advances, but for their generation, death was far more commonplace. Part and parcel of everyday life, if that’s not too perverse a turn of phrase. They’d lived through World Wars, lost young and old friends and relatives to all manner of illness and disaster, and still maintained that stiff upper lip. 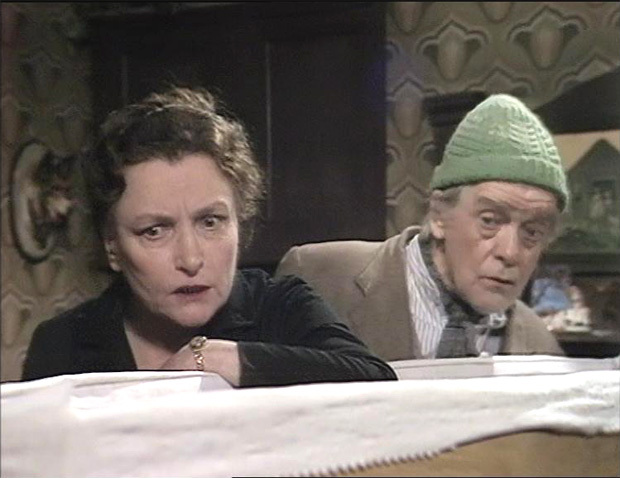 And so we get that most staple of 70s sitcom scenarios… an open coffin in the parlour, with Compo even straightening the corpse’s wonky tie. ‘He knew he were dying, I telled him…’ muses Murdoch’s widow Annie, almost proud of the accuracy of her prognosis. Andrew: I found the entirety of this episode quite awkward (not in a bad way, though) and I think the coffin scene is the height of this. The curtains are drawn, and the front room set is tiny and absolutely dominated by the casket. Just look at how hunched up our trio seem to be; their movements are just as restricted as those of their friend in the coffin… they’re forced back into a scene of domesticity that they’ve long since moved beyond themselves. The look that Clegg gives Murdoch’s wife as she talks about she and her sister foretelling the man’s death is at once hateful and terrified; we know what really killed the poor sod. 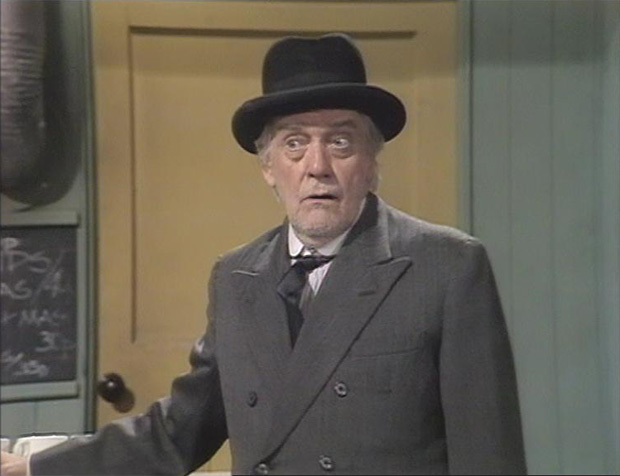 I also love Compo’s request that no scruffy buggers like himself should be allowed into his own funeral. It gets back to what you said about unsentimentality; Compo can make throwaway comments about his own mortality over the body of a dead man because he knows and accepts that his own passing will be along sooner rather than later. Bob: From the funeral onwards, we enter into a world of almost-surreally morbid whimsy. Clegg asserts that flowers are alive and have feelings, and I can’t decide whether he’s genuine, or just trying to wind up Foggy. Compo, meanwhile, decides to attack life with fresh vigour. ‘I want to feel the blood rushing through me wellies…’ he proclaims. Using Murdoch’s funeral as inspiration, every line of Roy Clarke’s script then urges us to celebrate life, and vitality, in every shape and form. It’s one of the most overt and positive messages from the writer I can ever recall seeing in Summer Wine. And it culminates in the splendidly surreal sight of Compo, Clegg and Foggy sitting cross-legged in a sun-dappled dingly dell, playing ‘Greensleeves’ to the plants on three discordant recorders. It’s bizarre and beautiful – like a scene from some wigged-out 1960s Summer of Love documentary. Summer Wine on acid, and a nice climax to one of the strangest and most atypical episodes we’ve seen so far. And the closing credits roll over a shot of Murdoch’s flower-strewn grave, just to ram the message home further. That’s where we’re all heading, so we should make the most of things while we still can. Andrew: Although he does turn things on their head at the end of the episode, I reckon that Clegg was really jarred by Murdoch’s funeral and his own near-death experience at the start of the episode. The moment where they are discovered by the birdwatchers is probably the point at which he snaps out of it! Listen to the studio audience, though. They really don’t know what to make of Clegg during this episode. Actually, this is something I’ve picked up upon in quite a few of the episodes so far – Clegg at his most existential and whimsical seems to be an incredibly difficult character for the audience to get their head around. Compo will swear a bit and the audience will roar with laughter, but when Clegg goes off on a tangent there’s an almost reverential hush. In any other sitcom this might be grounds to scale back on this aspect of Clegg’s character in order to make room for more jokes, but Clarke is clearly in love with him. Of all the characters, Clegg is Clarke’s alter-ego and I love the fact that he’s using a mainstream, flagship sitcom to set the world to rights in such a unique way. “Wales” is indeed an odd episode. It’s hard to belive that Foggy’s in that situation and whatever does happen to her? I wonder if this was originally meant to have featured Michael Bates as didn’t his character end up romantically involved in Wales? Perhaps, a few years on, this was dusted down for Foggy? I heard this on audio cassette once, where Clegg’s sudden bit about flowers being able to hear is explained as a ploy to have fun at the expense of the other two. Which spoils it a bit, really. Like the “Biggest Mouth” competition from the canoe episode, the final pay-off might seem neat, but there’s no way Clegg is setting that up from the get-go. It is nice to have Compo and Foggy united for once, though (*cough* Top Gear *cough*), even as they go down the road to oblivion. 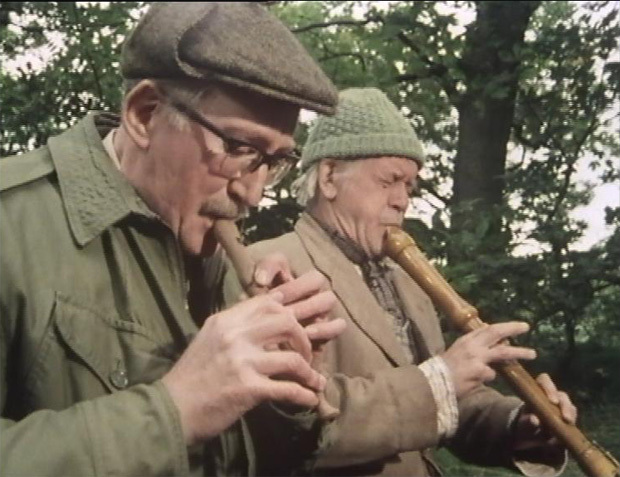 I believe earlier generations learned recorders at school, so this is a rare usage in later life of that skill-set. The final shot with the desperately scribbled card for Murdoch is a poignant gem to end a surprisingly morbid episode.